The first stage to projecting which draft-eligible prospects are considered to be future NHL stars was accomplished Thursday when Central Scouting released its preliminary rankings for the top levels of North American junior hockey. As much as the process has evolved into a news event, NHL Central Scouting director Dan Marr is quick to note the early rankings are subject to refinement by the time the organization releases its mid-term report in January. While there are several big names across the board on NHL Central Scouting's preliminary list of the top 2012 draft-eligible European skaters and goaltenders, it appears as though Sweden has the deepest pool from which to choose. NHL Director of European Scouting Goran Stubb told NHL.com in October that Sweden will present a hockey haven for most scouts this season, with Finland coming in second. "At present, there are some prospects from Russia, but no superstars," he said. "The Czechs, Slovaks, Swiss and Germans don't have anyone in the top 10 (among European skaters overseas) … right now." The top player from Sweden is forward Filip Forsberg of Leksand. The 6-foot-1, 180-pounder, no relation to former NHL All-Star Peter Forsberg, was spectacular for his country at the 2011 Ivan Hlinka Memorial Tournament in August, totaling 4 goals and 10 points in six games for the silver medal-winning Swedes. His ability with the puck has been compared to fellow Swede Daniel Alfredsson of the Ottawa Senators. "I think my offensive game is my biggest strength," Forsberg told reporters in July. "I like to shoot the puck, but I think I can play a complete game in terms of scoring, playmaking and defensive play." Said Stubb: "He's a talented, speedy, two-way forward who can score the big goals. He also has a good selection of shots." Forsberg is followed by Frolunda forward Sebastian Collberg. With decent size (5-11, 176) and sniper-like mentality off the right wing, Collberg had 21 goals and 44 points in 35 games with Frolunda HC in 2010-11. In addition to a great wrist shot, scouts love the fact he isn't afraid to initiate contact in the corners. "He has a great first step … is so quick," Stubb said. "He rushes down the wing and shoots a lot; he's got soft hands and a quick shot. He's a player with great offensive instincts." The Swedes might also possess the best goalie in the draft in 6-foot-2 1/2, 186-pound Oscar Dansk of Brynas Jr. In two games for Sweden at the 2011 World Junior A Challenge in Langley, B.C., Dansk produced a 0.98 goals-against average and .971 save percentage. The No. 1 skater in Finland is Teuvo Teravainen of Jokerit Jr. NHL Network analyst and prospect guru Craig Button labeled Teravainen as a potential sleeper for the 2012 Draft. The 5-11, 165-pound left wing had 16 goals and 35 points through 11 games for his Jokerit U-16 club in 2009-10. Last season, he had 5 goals and 17 points in 11 games for Finland's Under-17 Team. He has compared his style of play to Patrick Kane and Pavel Datsyuk. "Talk about a dynamic skater ... Teravainen is a guy who can make things happen so quickly," Button said. "He's really smart and able to draw defenders to him and make really good plays. Right now he's a little slight, but when you watch him on the ice, he's a real dynamic player. Right now, for me, he's a guy who is a first-round pick. By springtime, he could be mentioned among the top guys." Stubb agreed: "He speedy, quick and talented … an offensive-minded winger who, with quick, surprising moves creates scoring chances for linemates and himself around the net. He's a bit inconsistent from game to game and will need to improve in that area." The top-ranked skaters from other countries listed on Central Scouting's initial list include center Tomas Hertl of Slavia in Czech Republic, right wing Thomas Spelling of Herning in Denmark, center Marcel Kurth of Mannheim Jr. in Germany, left wing Nikolai Prokhorkin of CSKA 2 in Russia, defenseman Patrik Luza of Bratislava Jr. in Slovakia and right wing Joel Vermin of Bern in Switzerland. That said, let the debating begin. Marr and his staff ranked the top 25 skaters and top goaltenders for the Ontario Hockey League, Quebec Major Junior Hockey League, Western Hockey League and United States Hockey League, which has included the United States Under-18 National Team Developmental Program the past three seasons. The international rankings for eight countries were also released, as was a "watch" list for those prospects starring in college. The big storyline heading into the 2012 NHL Draft on June 22 at Consol Energy Center in Pittsburgh is that while it is top-heavy with quality defensemen, the first player off the board could very well be a forward. The odds are more favorable each day that whichever team holds the first pick in the draft will select Nail Yakupov of the Sarnia Sting in the Ontario Hockey League. Yakupov, who is Central Scouting's top-ranked player from the OHL, would be the first Russian player to go No. 1 since Alex Ovechkin went to the Capitals in 2004. "He's a dynamic player who plays with offensive energy … he wants the puck and he loves to score," Marr told NHL.com. "But what he's learning now is how to play the game without the puck; he's not an individual player and he has a pretty good sense of responsibility. "When I watched him [recently] in London, there was a checker on him the whole game and it was meant to frustrate him. But, to his credit, he found ways to skate away and generate chances. A lot of guys would have been frustrated, retaliate or take penalties, but he showed that he could handle that kind of checking and find another way to produce, so it didn't curtail from playing his game." In 21 games for the Sting this season, Yakupov has 14 goals, 41 points and a plus-17 rating. He was named the Canadian Hockey League's Rookie of the Year last season after producing 49 goals and 101 points -- the latter total shattered Steven Stamkos' team record for a rookie (92 points in 2006-07). Yakupov is followed by Sarnia teammate Alex Galchenyuk, who is ranked No. 2 despite not having played a game this season after undergoing surgery to repair a torn anterior cruciate ligament on Oct. 27. The top-rated defenseman from the OHL is Olli Maatta of the London Knights. The Finland native is playing his first season in North America, thus far posting 11 points and a plus-9 rating in 20 games for the Knights. Leading the way among the Western Hockey League standouts is defenseman Ryan Murray, captain of the Everett Silvertips. Murray, who suffered a lower-body injury Oct. 19 in a game against the Brandon Wheat Kings, might resume skating in either late November or early December. The defenseman told NHL.com he is determined to get back on the ice in time to be considered a legitimate candidate for a roster spot on the Canadian National Junior Team competing in the 2012 World Junior Championship in Edmonton and Calgary. Murray was the first of five straight defensemen on the WHL list. He is followed by No. 2 Morgan Rielly of the Moose Jaw Warriors, No. 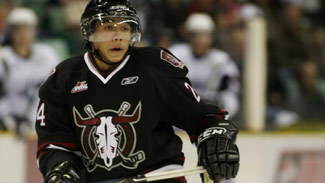 3 Mathew Dumba of the Red Deer Rebels, No. 4 Derrick Pouliot of the Portland WinterHawks and No. 5 Griffin Reinhart of the Edmonton Oil Kings. The first forward on the board from the WHL is No. 6 Colton Sissons of the Kelowna Rockets. Both Dumba and Sissons played for Team WHL against the Russians on Wednesday in the fifth game of the 2011 Subway Super Series at Brandt Centre in Regina, Sask. Team WHL head coach Don Hay was impressed with both players. "What stands out with this group of D-men is their composure and presence on the ice," Marr said. "They can handle pressure well and they don't get rattled. A majority of them are strong skaters, so they have those puck-moving skills of guys have who are successful in the NHL. For their age, they are as complete in development as you'll see." Topping the list among the QMJHL contingent is rookie Russian import Mikhail Grigorenko of the Quebec Remparts. In 16 games this season, Grigorenko (6-foot-3 1/4, 200 pounds) has 16 goals and 34 points. The left-handed center, also in the discussion to go No. 1 in June, played for CSKA in Russia's minor league system last season, notching 17 goals and 35 points in 43 games. He produced 4 goals and 18 points in seven games for bronze medal-winning Russia at the 2011 Under-18 World Junior Championship. Grigorenko is followed on the QMJHL list by right wing Martin Frk of the Halifax Mooseheads. Frk hasn't played a game this season due to post-concussion symptoms. He is scheduled to resume skating in December. As a rookie in 2010-11, Frk finished fourth in the league with 50 points, including 22 goals. Jacob Trouba, who stars for the U.S. National Team Development Program's Under-18 team, is the top-rated junior skater in the USHL. The 6-2, 193-pound defenseman, who will attend the University of Michigan next fall, has 2 goals, 6 points and 18 penalty minutes in 17 games this season. Players from the USNTDP account for five of the top-10 rated players from the USHL. They include forward Stefan Matteau (No. 4) and defensemen Brady Skjei (No. 5), Nicolas Kerdiles (No. 7) and Patrick Sieloff (No. 10). The top-rated non-USNTDP skater on the USHL list is Dubuque center Zemgus Girgensons, who comes in at No. 2. Girgensons, committed to the University of Vermont next fall, has 8 goals and 17 points in 12 games for the Fighting Saints this season. His teammate, defenseman Michael Matheson, is No. 3 on the list. Matheson, committed to Boston College, has 2 goals, 5 points and a plus-5 rating through 13 contests. Which players have begun to get NHL scouts attention for the 2012 NHL Draft? Among the goalies, Malcolm Subban of the Belleville Bulls is tops in the OHL. As a rookie last year, the brother of Montreal Canadiens defenseman P.K. Subban went 10-17-0 in 32 appearances and finished second among OHL rookie goalies with a 3.16 goals-against average and .900 save percentage. Since being taken off injured reserve earlier this month, Subban has looked superb, going 5-2-0 in seven games with a 2.09 GAA and .930 save percentage. "Malcolm is very strong and has excellent net coverage," Central Scouting's Al Jensen, who specializes in goalies, told NHL.com. "He has exceptional flexibility and quickness, great strength in his leg pushes needed for lateral ability and recovery. He's got a quick glove hand and excellent work ethic. He'll always give himself a chance to stop the puck and is capable of making the big saves." In the QMJHL, Francois Tremblay of Val-D'Or is the No. 1-rated goalie. Tremblay is 9-12-2 with a 3.45 GAA and .884 save percentage for the Foreurs. "He's a technically sound goalie," Jensen said. "He has a very good butterfly and plays big even in his butterfly. He's calm and relaxed and offers good leg extension. He has a good glove hand; he's more of a positional style goalie, smart at reading the plays." Andrey Makarov of the Saskatoon Blades is the top keeper in the WHL. In 18 games with Saskatoon in 2011-12, Makarov is 13-5-0 with a 2.44 GAA and .929 save percentage. The native of Kazan, Russia, spent the 2010-11 season with the Lewiston MAINEiacs of the QMJHL, finishing with a 3.37 GAA and .890 save percentage. "Andrey is very athletic and plays an unorthodox style, but has good quickness in all areas," Jensen said. "He's smart at reading situations and is confident. He's made a huge turnaround from last year, has good recovery and reactions, and he's always trying to get his body in front of shots. He never gives up on a play and is strong at holding his ground." Jon Gillies of the Indiana Ice is No. 1 among goalies in the USHL. The 6-foot-5, 215-pounder from South Portland, Me., is committed to Northeastern University for the fall of 2013. He won 15 games for the Ice last season with a 2.82 GAA and .906 save percentage. This season, he's already 6-2-3 with a 2.27 GAA and .919 save percentage in 11 appearances. "Jon has shown good poise and great quickness in there," Jensen said. "He's shown great potential and will certainly be a top prospect among the goalies this year."